This article is about the German state. For the similarly named German city, see Bremen. For other uses, see Bremen (disambiguation). Bremen (German: [ˈbʁeːmn̩] ( listen)), officially the Free Hanseatic City of Bremen (German: Freie Hansestadt Bremen), is the smallest and least populous of Germany's 16 states. It is informally called Land Bremen ("State of Bremen"), although this is sometimes used in official contexts. The state consists of the city of Bremen as well as the small exclave of Bremerhaven in Northern Germany, surrounded by the larger state of Lower Saxony. (2017-12-31) "Bevölkerung, Gebiet - Aktuelle Statistische Berichte - Bevölkerungsentwicklung im Land Bremen". Statistisches Landesamt Bremen (in German). September 2018. The state of Bremen consists of two separated enclaves. These enclaves contain Bremen, officially the 'City' (Stadtgemeinde Bremen) which is the state capital and located in both enclaves, and the city of Bremerhaven (Stadt Bremerhaven). Both are located on the River Weser; Bremerhaven is further downstream than the main parts of Bremen and serves as a North Sea harbour (the name Bremerhaven means "Bremen's harbour"). Both enclaves are completely surrounded by the neighbouring State of Lower Saxony (Niedersachsen). The two cities are the only administrative subdivisions the state has. The highest point in the state is in Friedehorst Park (32.5m). 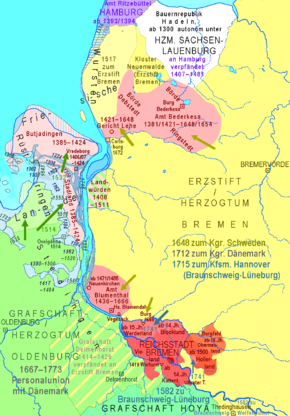 At the unwinding of the Holy Roman Empire in 1806 the Free Imperial City of Bremen (as of 1646, after earlier privileges of autonomy of 1186) was not mediatised but became a sovereign state officially titled Free Hanseatic City of Bremen. Its currency was the Bremen thaler (until 1873). In 1811 the First French Empire annexed the city-state. Upon the first, albeit only preliminary, defeat of Napoléon Bonaparte, Bremen resumed its pre-1811 status as city-state in 1813. The Vienna Congress of 1815 confirmed Bremen's—as well as Frankfurt's, Hamburg's, and Lübeck's—independence after pressuring by Bremen's emissary, and later burgomaster, Johann Smidt. Bremen became one of 39 sovereign states of the German Confederation. 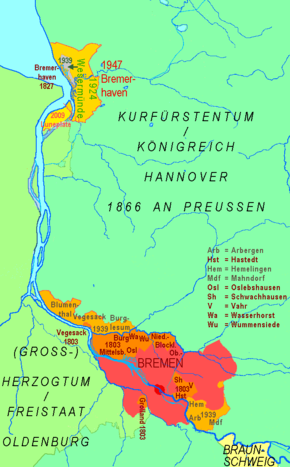 In 1827 the state of Bremen bought the tract of land from the Kingdom of Hanover, where future Bremerhaven would be established. Bremen became part of the North German Confederation in 1867 and became an autonomous component state of the new-founded German Empire in 1871 and stayed with Germany in its following forms of government. Bremen, which in 1935 had become a regular city at the de facto abolition of statehood of all component German states within the Third Reich, was reestablished as a state in 1947. Being—at that time—actually located in the British Zone of Occupation the Control Commission for Germany - British Element and the Office of Military Government for Germany, U.S. (OMGUS) agreed in 1947 to constitute the cities of Bremen and then Wesermünde—in their borders altered in 1939—as a German state named again Free Hanseatic City of Bremen, becoming at that occasion an exclave of the American Zone of Occupation within the British zone. In 1949 the city-state joined the then West German Federal Republic of Germany. The legislature of the state of Bremen is the 83-member Bürgerschaft (citizens' assembly), elected by the citizens in the two cities of Bremen and Bremerhaven. The executive is constituted by the Senate of Bremen, elected by the Bürgerschaft. The Senate is chaired by the President of the senate (Senatspräsident), who is also one of the mayors of the city of Bremen (Bürgermeister) and is elected directly by the Bürgerschaft. The Senate selects of its members as a second mayor who serves as deputy of the president. In contrast to the Federal Chancellor of Germany or other German states, the President of the Senate has no authority to override senators on policy, which is decided upon by the senate collectively. Since 1945, the Senate has continuously been dominated by the Social Democratic Party. The administration of the city of Bremen is headed by the two mayors and controlled by the portion of the Bürgerschaft elected in the city of Bremen (68 members). Bremerhaven, on the other hand, has a municipal assembly distinct from the state legislature and an administration under a distinct head mayor (Oberbürgermeister) and a distinct second mayor. Henning Scherf (SPD) remained Mayor and Senate President, in an SPD-CDU grand coalition. As promised he resigned after half of the legislative period. The Mayor and Senate President from 8 November 2005, until 17 July 2015, was Jens Böhrnsen. The 2007 elections were held on 13 May. Seat results − SPD in red, CDU in black, Greens in green, FDP in yellow, The Left in purple, DVU in brown. Note: The only DVU representative, Siegfried Tittmann, left the party in July 2007 and has not joined another party. The unemployment rate stood at 9.5% in October 2018 and was the highest of all 16 German states. The University of Bremen is the largest university in Bremen. Furthermore, Bremen has a University of the Arts Bremen, a University of Applied Sciences in Bremen and another one in Bremerhaven, and more recently the Jacobs University Bremen. ^ This situation earned the state its new prefix "AE" for vehicle registration, meaning "American Exclave", used until the federal reform of vehicle registration with effect of 1 July 1956. ^ "Arbeitslosenquote nach Bundesländern in Deutschland 2018 | Statista". Statista (in German). Retrieved 2018-11-13. ^ (Destatis),, © Statistisches Bundesamt (2018-11-13). "Federal Statistical Office Germany - GENESIS-Online". www-genesis.destatis.de. Retrieved 2018-11-13. Wikimedia Commons has media related to Bremen (state).